Only a handful of strikes in the twentieth century helped change the course of American labor history. 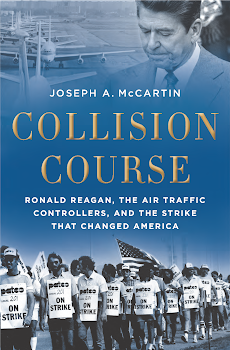 For reasons I explain in my book, I think the air traffic controllers' strike of 1981 was one of those. Most historians would agree that the 1936-37 sit-down strike by autoworkers in Flint, Michigan, was another. 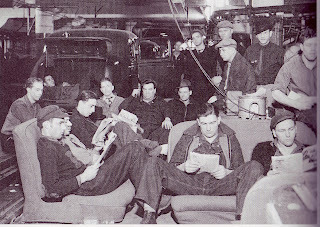 On December 30, 1936, autoworkers stopped the assembly line at General Motors' Fisher #1 body plant in Flint, and instead of leaving the plant to picket outside they occupied it. 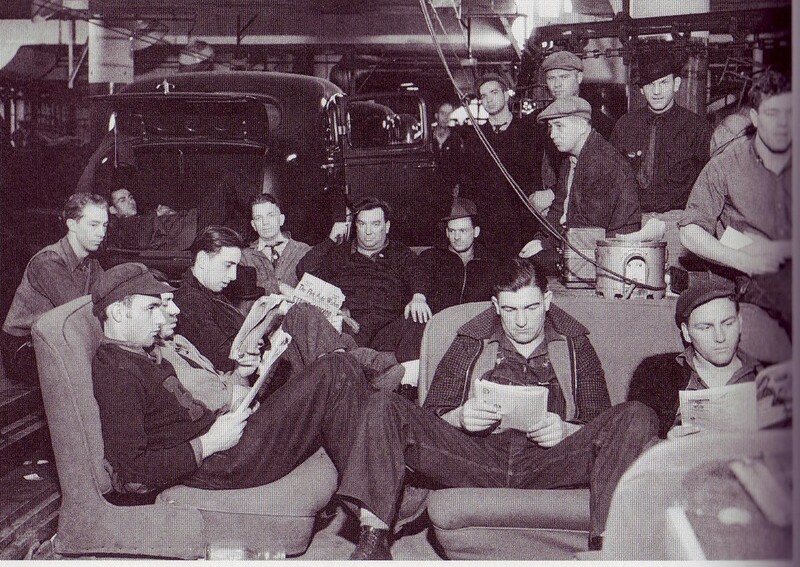 They stayed in the plant for 44 days, repelling an effort by the Flint police to evict them on January 11, 1937, holding fast until GM signed an agreement recognizing their union on February 11, 1937. Their victory propelled the success of the United Auto Workers union and the Congress of Industrial Organizations, and helped facilitate the organization of millions of industrial workers in the years thereafter. I feel compelled to write and tell you how much I appreciate the fine work you did in researching and presenting the story of the PATCO strike.... 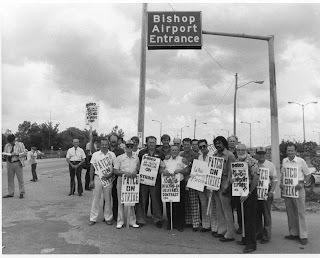 I believe that I was the only elected president of a local (PATCO Local 375) who also served concurrently as a Choirboy. As such, all messages, telegrams, telephone updates and other correspondence flowed through me during the 1981 strike and they are still in my possession. I also still retain the strike journals of the phone messages sent into the strike headquarters for our cluster. Each update and message was recorded in a spiral notebook and I have all four of them. Still in possession of all of those records, I would periodically take a break from reading your book to look through my personal archives. I even found my photograph of the Flint UAW 1937 Sit-down Strikers who joined us on our picket line. I am not in the big picture of the UAW sit-down strikers. The only name I know is the younger man 6 from the right, wearing sun glasses. I recall his name is Ron Perkins. 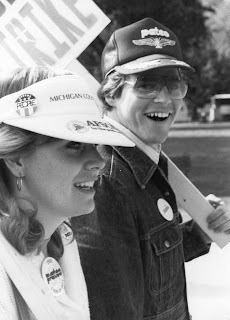 He was a Flint UAW Local union president and he gave us wonderful support. He organized the visit from the 1937 Sit-down strikers. They actually are called the Pioneers of the UAW. An interesting aside, virtually all of them carried a medallion. Some incorporated into a belt buckle, some as a slide on a string tie, some carried it in their pocket. It was struck by the UAW to commemorate the Flint 1937 UAW sit-down strike and on one side it read, "For Winning". Many showed me their medallion and they were quite proud of it.... They shared their stories with me and it was amazing what courage they had, facing the Michigan National Guard.... They stayed put. They said that John L. Lewis stood in front of a window and claimed that his would be the first breast the bullets struck.... What they won was recognition. Some of those hardy old men walked our picket line carrying a PATCO sign in one hand and pulling an oxygen bottle with the other. They were there more than one day, and even walked in a cold rain. Nearly made me weep to see it. I could go on for as many pages as are in your book but I'll be brief. I just want to thank you for your fine work and I'd like to say that my PATCO ON STRIKE picket sign is matted and framed and hangs in my office, alongside the charter document creating PATCO Local 375, Flint ATCT. I rescued the PATCO Charter when I reported to the tower to be given notice of my termination by the facility chief. Some of us from Flint ATCT still get together regularly and have maintained our close friendship. As much as I suffered, and as much as I hate Ronald Reagan to this day, I am proud of my stand.